See all the pictures from the closing ceremony of the 2012 Olympic Games in London. 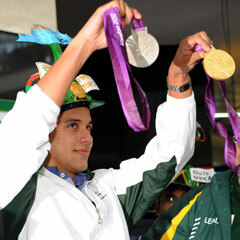 Johannesburg - South African Olympic gold medallist Chad le Clos says he's overwhelmed by the show of public support he's received since he returned from the London Olympics. "The attention can be overwhelming, but I'm enjoying it all," he told Beeld. His father, Bert le Clos, whose exuberant BBC interview just after Chad's 200m butterfly win went viral on the internet, said his son was too young to get married, but he should definitely make the most of female friendships. "He should enjoy all the attention from the girls. I'm a big supporter of friends with benefits," le Clos senior was quoted as saying. Chad, who was being jointly interviewed, was visibly embarrassed by his father's statement, but Bert was quick to smooth things over. "You're such a beautiful boy," he told Chad. The Olympic winner told Beeld that although he wasn't as emotionally expressive as his dad, he could still wipe away the occasional tear. "I don't cry as easily as my dad, but I'm becoming more like him as I get older," he joked. Bert said he wasn't going to apologise for his emotions. "I am who I am. I show emotions and I cry when I'm happy or sad. Men should be able to cry," he said.